I frequent a local Mexican restaurant about once a week, and it is typically the same one every time. They know me so well, almost like Norm Peterson in Cheers, whereas as soon as I find a place to sit, I am delivered my usual horchata, and on occasion they simply bring me my usual plate of three tacos al pastor without me even ordering. Yes, it’s that good. I do on occasion want to see a menu however, only to tempt my taste buds with something other than the tacos. But, man, I love tacos. There are two things on their menu that is a bit pricey and that is the tostada and their enchiladas. 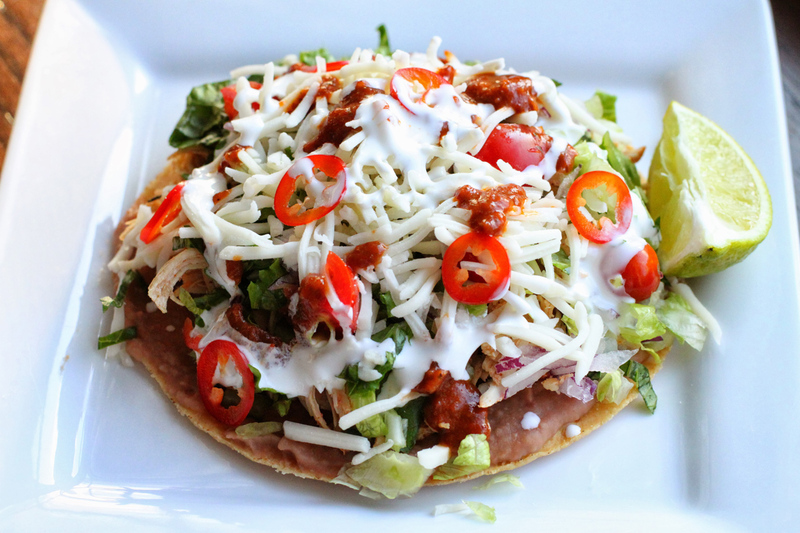 I also love a great tostada and as I know they are super easy to make, they can also be a bit messy should the tostada fall apart on you, mid bite. That’s why I make these at home, and I think you should as well. 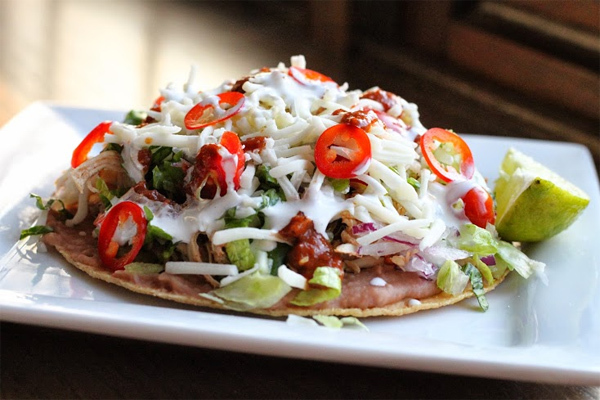 There are some great things about chicken tostadas, not only are they open faced tacos, but there is one thing that shines on the tostada and that is refried beans. My wife, who doesn’t care for refried beans for the most part, will definitely take on the tostadas loaded with refried beans, so that is saying something. This recipe is really quick and easy to make, and it great for make as an appetizer, or as a meal. Once the chicken is pulled apart, add it so a large skillet and add in the taco seasoning and water. Bring to a simmer after mixing the chicken with the seasoning. Cover, remove from the heat and set it aside. Preheat your oven to 320 degrees. In the meantime, warm your beans until warmed through. Have all of your ingredients ready. I like to prepare these family style, allowing the table to build their tostada. Heat your tostadas for about 4-6 minutes. Once the tostadas are warmed through, remove them from the oven and place onto a serving dish. Add the chicken to a serving bowl. To serve, cover the tostada with a generous layer of refried beans. Doing so allows the rest of the ingredients to ‘stick’ together, so the beans basically serve as your glue for this dish. Top the chicken, then lettuce, tomato, onion, cilantro, cheese, and chilies. Drizzle with the crema, hot sauce and a bit of lime juice. Pick up the tostada with both hands and bite on in. To me, this is a perfect bite. It’s similar to what you might expect within a Mexican torta, however delivered on a crispy tostada shell. Let’s just say these are not only easy to make, but they are super delicious and everyone at the table devoured them. That’s always saying something. I hope you enjoy. 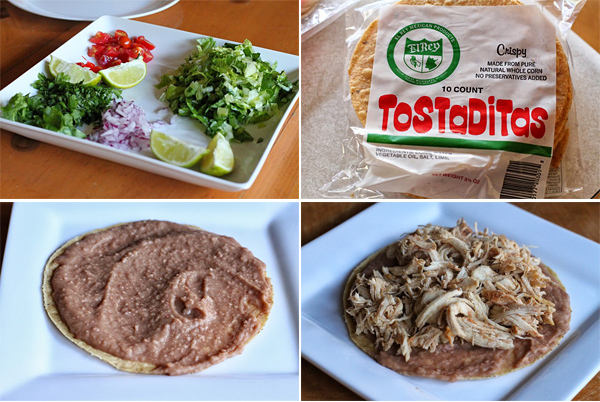 To serve, cover the tostada with a generous layer of refried beans. Doing so allows the rest of the ingredients to 'stick' together, so the beans basically serve as your glue for this dish. Top the chicken, then lettuce, tomato, onion, cilantro, cheese, and chilies. Drizzle with the crema, hot sauce and a bit of lime juice. Pick up the tostada with both hands and bite on in. To me, this is a perfect bite. It's similar to what you might expect within a Mexican torta, however delivered on a crispy tostada shell. Let's just say these are not only easy to make, but they are super delicious and everyone at the table devoured them. That's always saying something. I hope you enjoy. this looks extremely tasty. can I ask the name of the restaurant you frequent? Hi Kay… I go to El Rey in Milwaukee, the original location. It has both the eatery and grocery so I get the best of both when I visit.